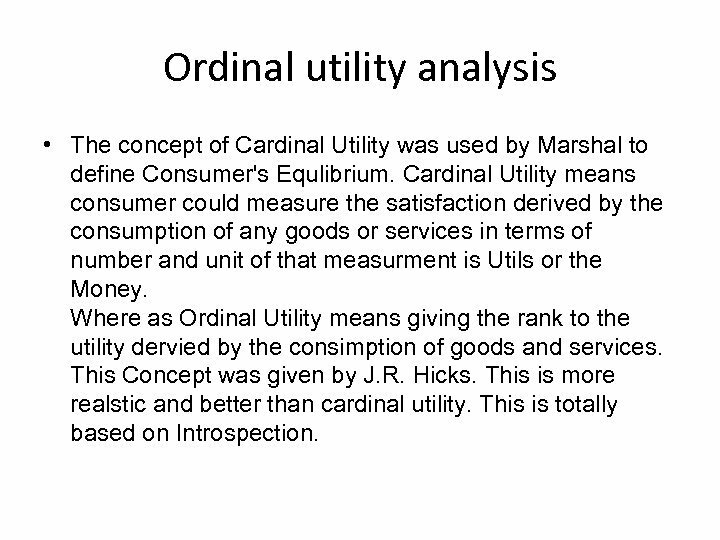 Ordinal utility analysis • The concept of Cardinal Utility was used by Marshal to define Consumer's Equlibrium. 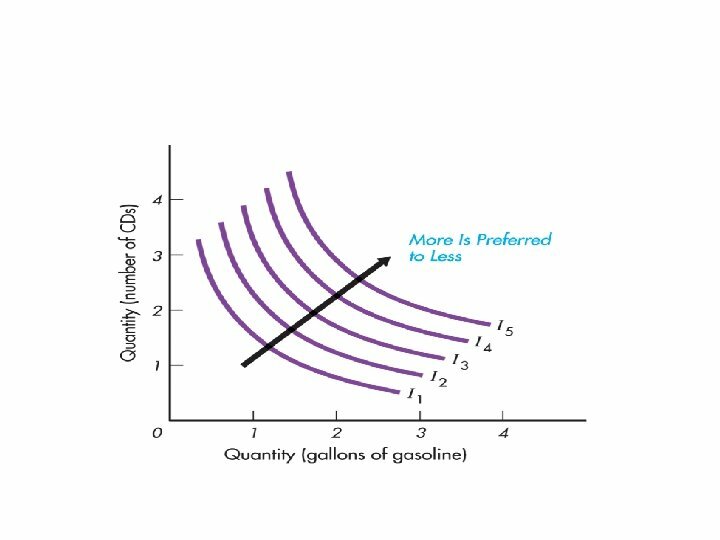 Cardinal Utility means consumer could measure the satisfaction derived by the consumption of any goods or services in terms of number and unit of that measurment is Utils or the Money. 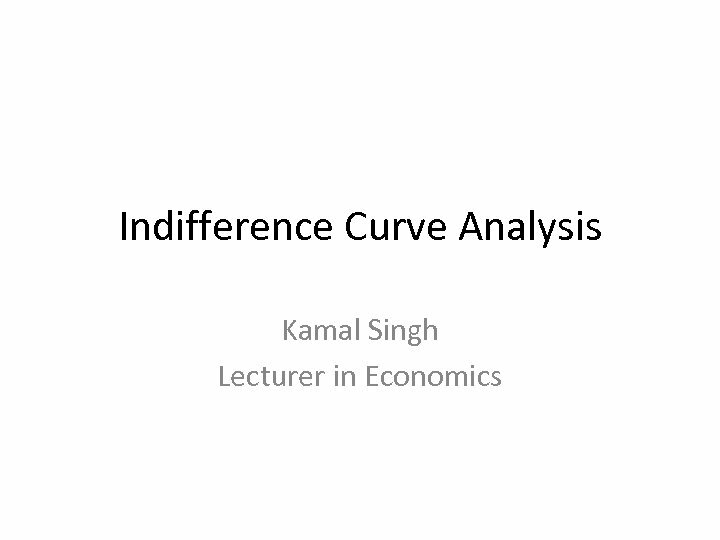 Where as Ordinal Utility means giving the rank to the utility dervied by the consimption of goods and services. 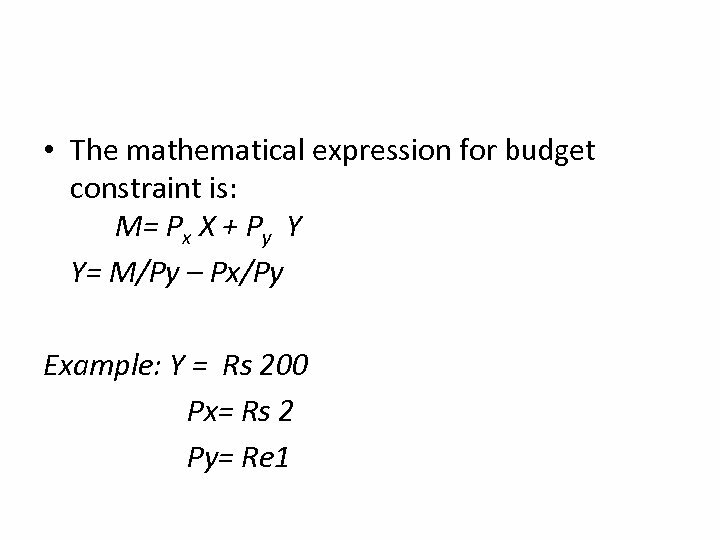 This Concept was given by J. R. Hicks. 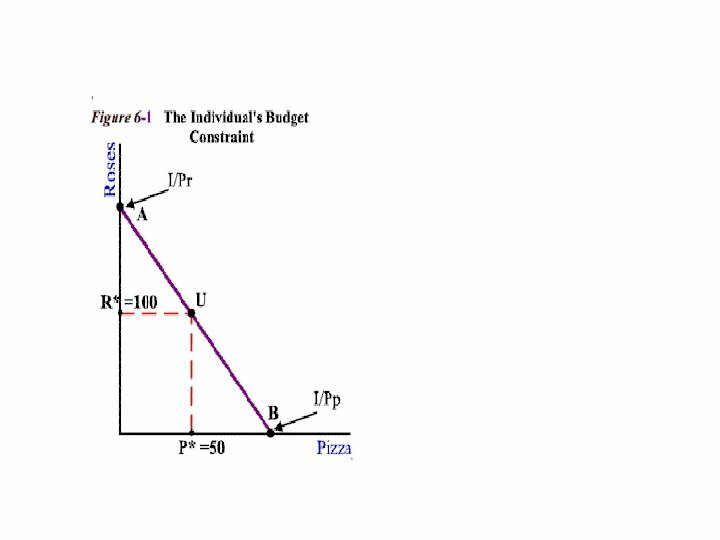 This is more realstic and better than cardinal utility. This is totally based on Introspection. 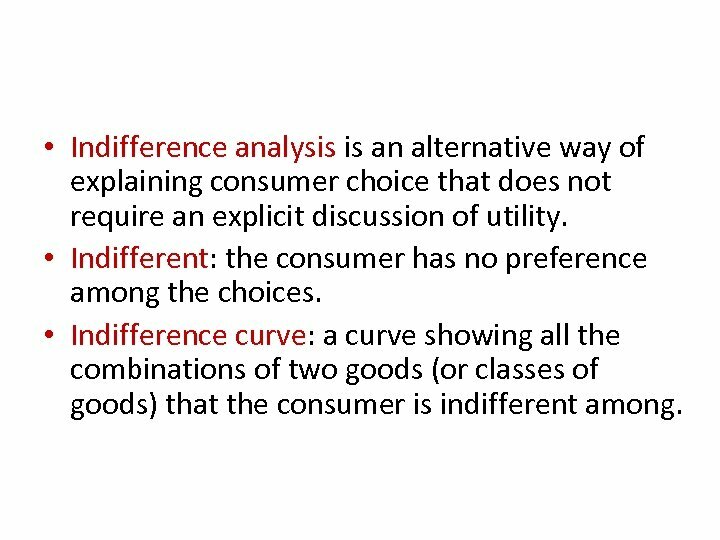 • Indifference analysis is an alternative way of explaining consumer choice that does not require an explicit discussion of utility. 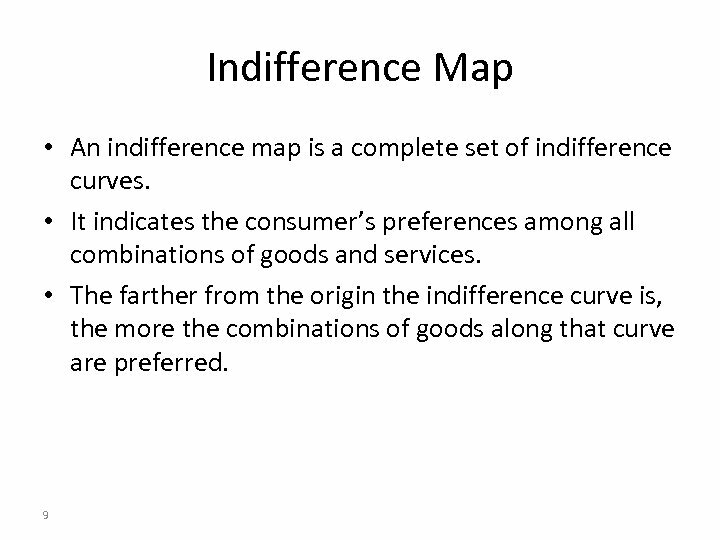 • Indifferent: the consumer has no preference among the choices. 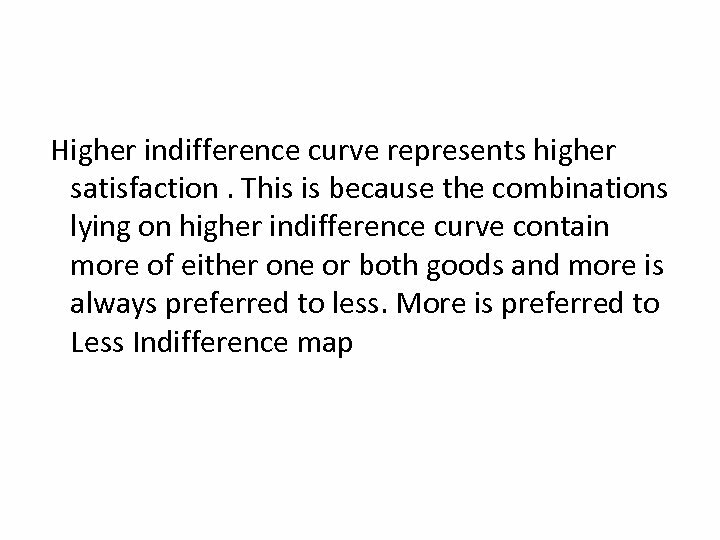 • Indifference curve: a curve showing all the combinations of two goods (or classes of goods) that the consumer is indifferent among. Assumptions • Rational Consumer Ordinal Utility Non-Satiety (More is Preferred to Less) Diminishing Marginal Rate of Substitution. 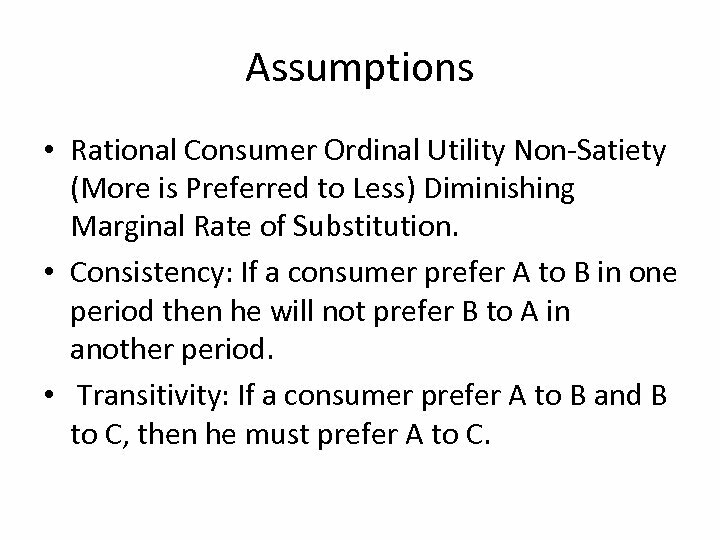 • Consistency: If a consumer prefer A to B in one period then he will not prefer B to A in another period. 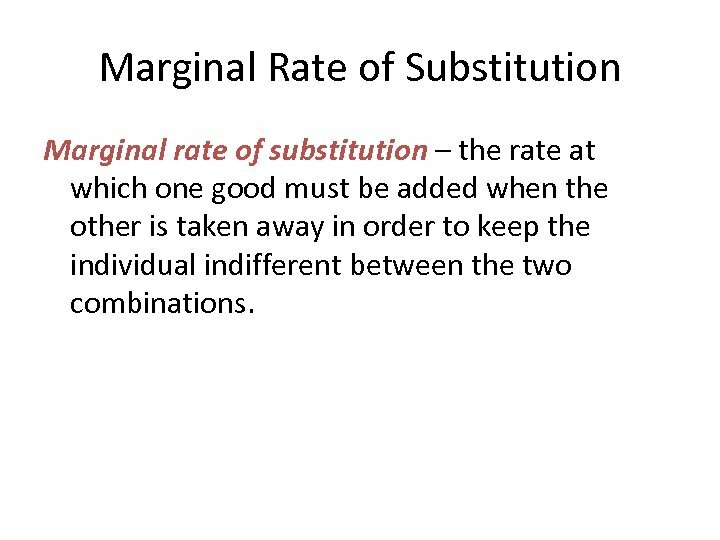 • Transitivity: If a consumer prefer A to B and B to C, then he must prefer A to C.
Marginal Rate of Substitution Marginal rate of substitution – the rate at which one good must be added when the other is taken away in order to keep the individual indifferent between the two combinations. 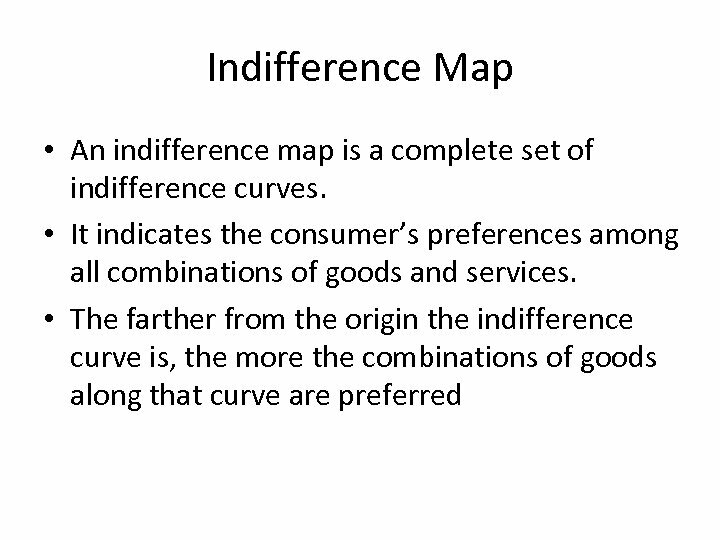 Indifference Map • An indifference map is a complete set of indifference curves. 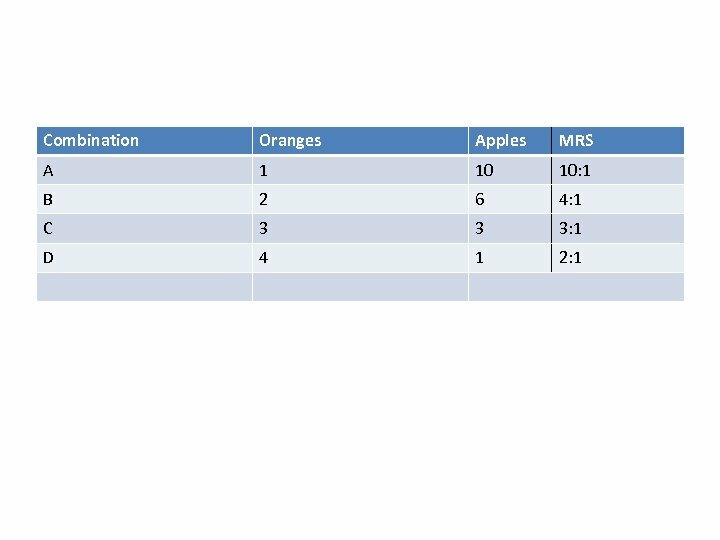 • It indicates the consumer’s preferences among all combinations of goods and services. 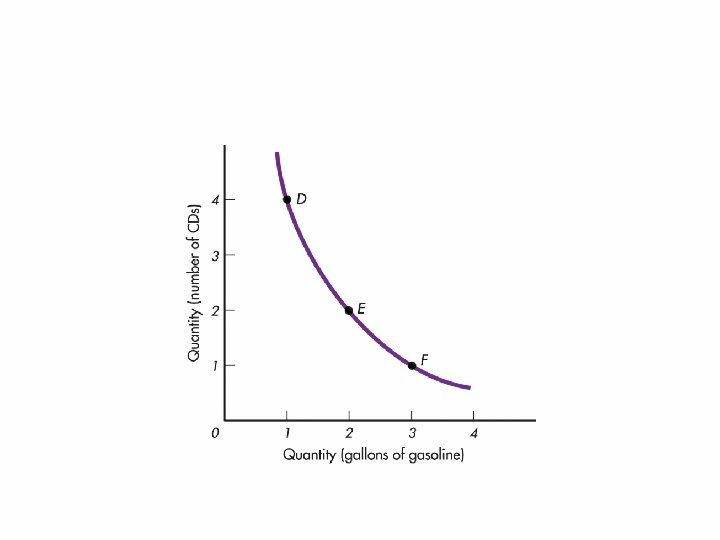 • The farther from the origin the indifference curve is, the more the combinations of goods along that curve are preferred. 9 Copyright © Houghton Mifflin Company. All rights reserved. 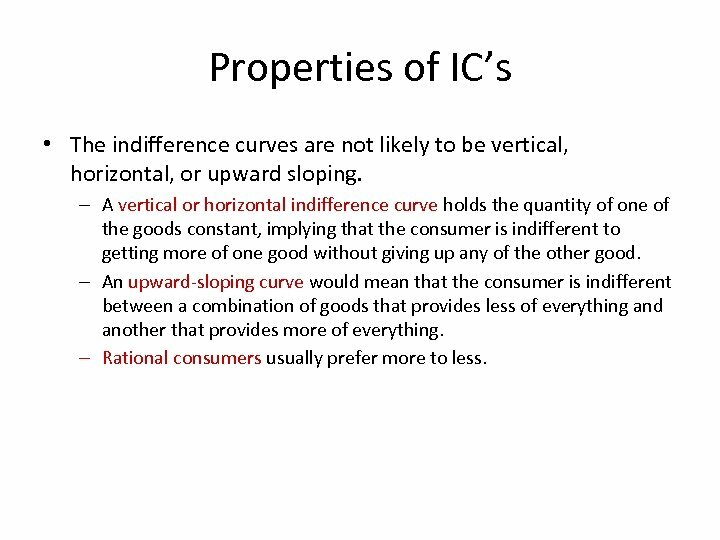 Properties of IC’s • The indifference curves are not likely to be vertical, horizontal, or upward sloping. 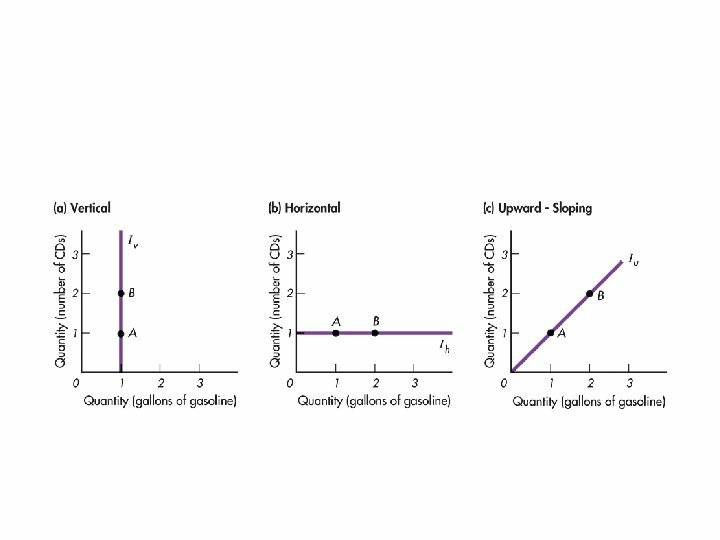 – A vertical or horizontal indifference curve holds the quantity of one of the goods constant, implying that the consumer is indifferent to getting more of one good without giving up any of the other good. 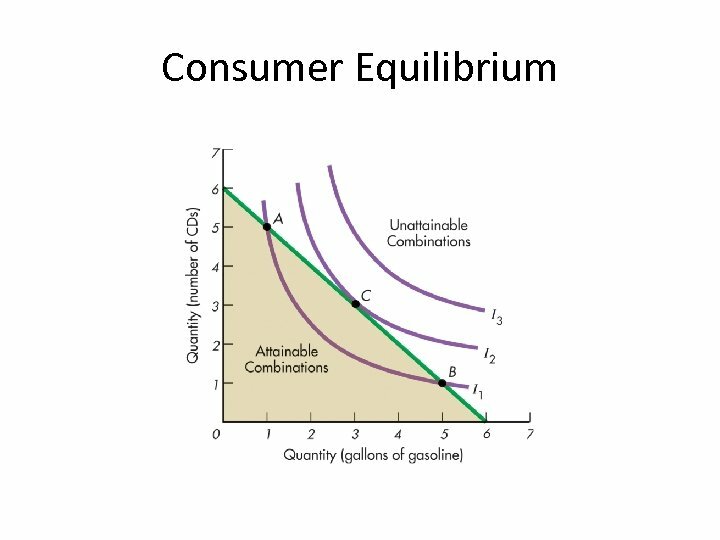 – An upward-sloping curve would mean that the consumer is indifferent between a combination of goods that provides less of everything and another that provides more of everything. 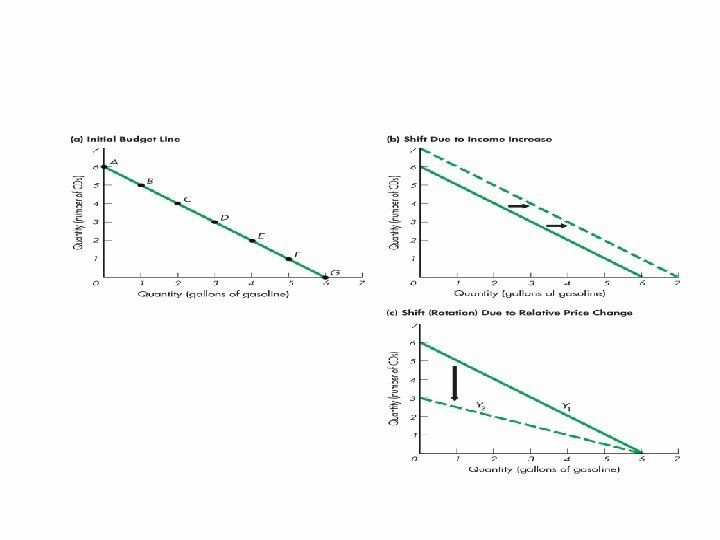 – Rational consumers usually prefer more to less. 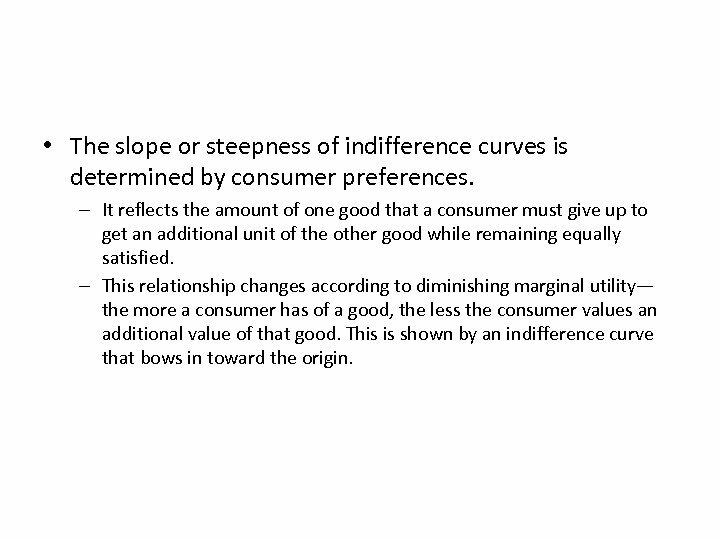 • The slope or steepness of indifference curves is determined by consumer preferences. 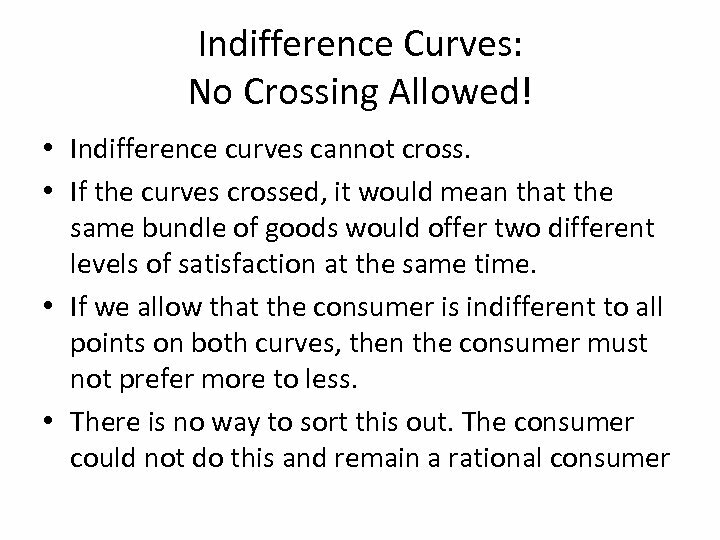 – It reflects the amount of one good that a consumer must give up to get an additional unit of the other good while remaining equally satisfied. 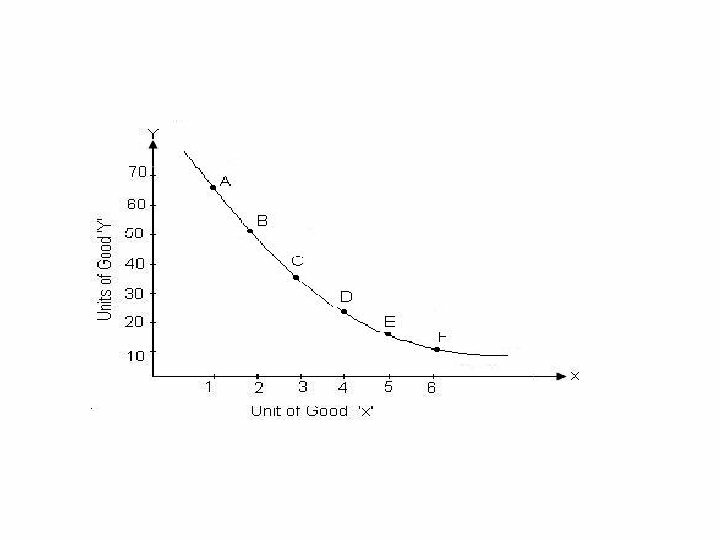 – This relationship changes according to diminishing marginal utility— the more a consumer has of a good, the less the consumer values an additional value of that good. 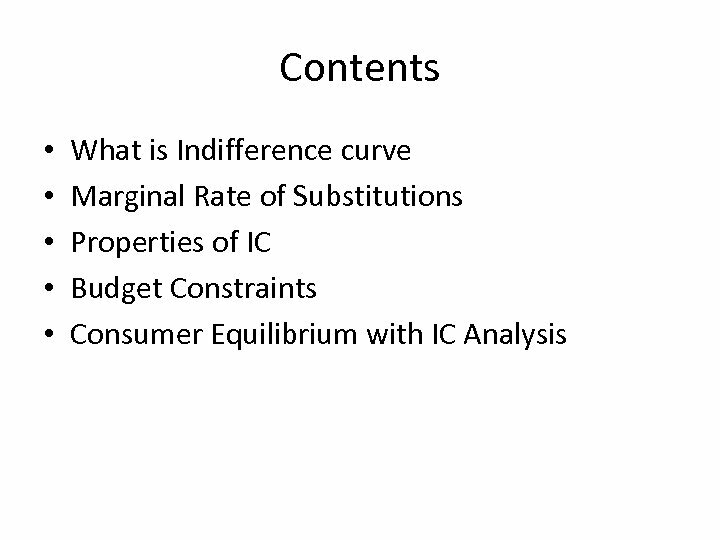 This is shown by an indifference curve that bows in toward the origin. 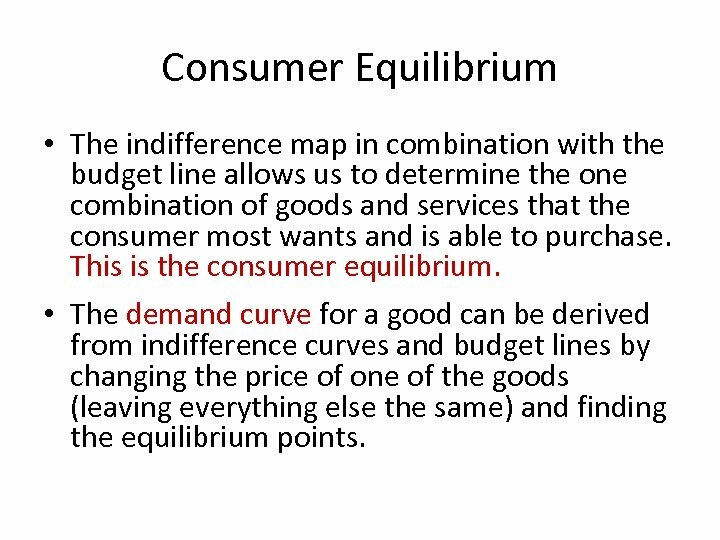 Consumer Equilibrium • The indifference map in combination with the budget line allows us to determine the one combination of goods and services that the consumer most wants and is able to purchase. 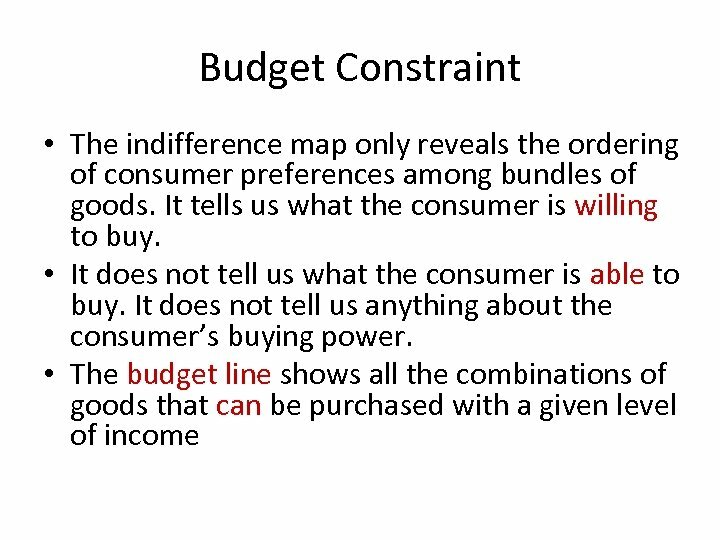 This is the consumer equilibrium. 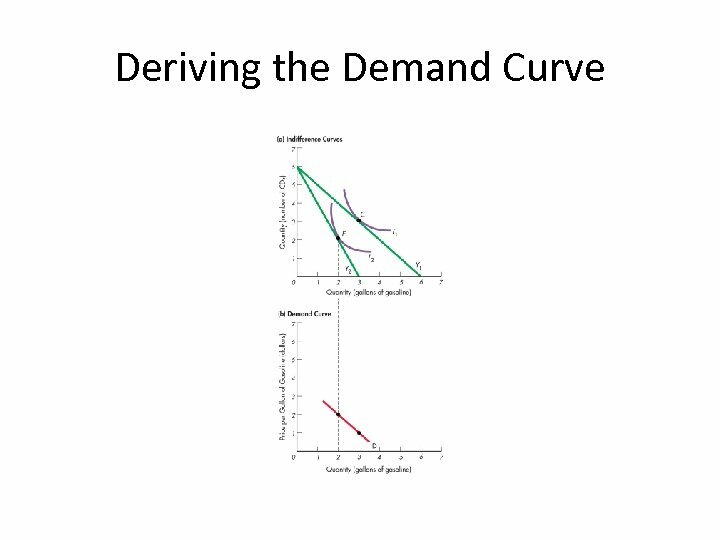 • The demand curve for a good can be derived from indifference curves and budget lines by changing the price of one of the goods (leaving everything else the same) and finding the equilibrium points.